The transition from student to instructor in the art of San Soo has been natural for a man who was willing to start over with each instructor, in order to learn and fine tune his skills as much as possible. From baseball and wrestling to gymnastics, Michael’s desire to excel in all things has been the catalyst for his desire to be the best he can be in San Soo. The journey to becoming a black belt in the art of San Soo, and now a Master, has been longer than most, but the color of his belt is the least of his concerns. Michael does not judge his ability by the color of his belt, but by the knowledge and wisdom he has gained through his studies. In this philosophy, he is completely in tune with Lo Sifu and how he taught Kung Fu San Soo, from the beginning until his death. He also shares Lo Sifu’s dedication to the teaching and building of character. Although he did not study directly under Lo Sifu, he has been taught by his first generation instructors and garnered the essence of what Lo Sifu stood for and, therefore, the art of San Soo. From early on, Michael enjoyed the challenge and competitiveness of athletics. He competed in organized baseball and excelled in the sport, but baseball was not the only outlet he had for his athletic ability. He also played basketball and football, and at the age of 13 took up horse training and wrestling. All of these endeavors were new challenges for him. He enjoyed the teamwork of baseball, basketball and football, but the one-on-one competition of wrestling seemed to appeal to him more. His natural competitiveness was challenged by the knowledge that on the mat, it was up to him alone to come out the victor, and if a challenger beat him once, it fired him up to be the victor in the next meeting. While he was at Alta Loma High School, he got his first glimpse of San Soo from one of the students at the school. Russell Couch, a sophomore, put on a demonstration of the art in 1972. According to Michael, “From that moment, I was hooked for life!” The focus on practical hand-to-hand combat was appealing to the young wrestler. Again, it was the one-on-one competition that was a challenge to him. This exposure to the art of San Soo influenced his decision to study with Jerry Druckerman, when he met him four years later at Chaffey College. Michael was attending Chaffey College and met Jerry in gymnastics. They decided to exchange expertise. Michael helped Jerry with gymnastics, and Jerry taught Michael San Soo. He took both group and private lessons with Jerry for close to a year, until Jerry closed his studio. Upon closing his studio in 1977, Jerry introduced Michael to Master Bill Lassiter at his Ontario, California studio. 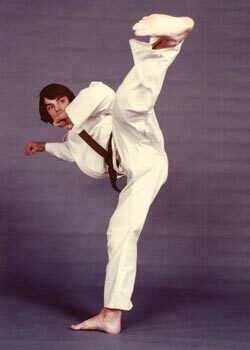 Although Michael was a green belt, he chose to begin as a white belt with Master Bill, but advanced quickly, due to his prior studies in the art. 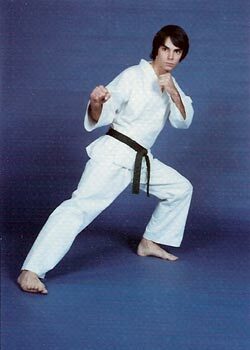 By 1979, Michael was on the verge of receiving his black belt, but he had to discontinue his studies. While working in real estate, he was able to make his own schedule and study as often as possible, but when he went into the sales force, his schedule was more structured and he began to travel. This new position forced him to put his San Soo studies on hold; however, he did not hang up the art of San Soo completely. While he was not studying under a Master, the extra years of study had reinforced his sense of discipline and dedication. Michael practiced his technique and form regularly, and he was able to work out wherever he traveled. He also took on a part-time job as a nightclub bouncer which utilized his fighting skills. There was more than one occasion when he was thankful for the San Soo techniques he had mastered, but that’s another story! In 1982, Michael’s life took another turn, but this time he faced a spiritual challenge. Although he accepted the Lord as a senior in high school, he did not continue to walk with Him. It was not a coincidence, but God’s divine intervention when he went to Calvary Chapel West Covina and heard Pastor Raul Ries teach. Michael rededicated his life to the Lord in 1982, after attending Pastor Raul’s studies for a short time. It was also not a coincidence that Pastor Raul was a Kung Fu San Soo Master. After hearing Pastor Raul mention Jimmy Woo (Lo Sifu) and San Soo in 1991, Michael was prompted to talk with him about San Soo. Soon after, Pastor/Master Raul began a class for the staff and eventually opened it up to the congregation. 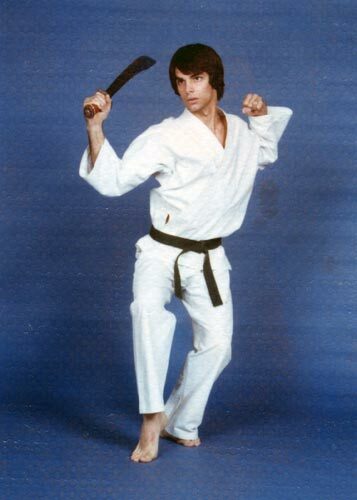 As in the past, Michael started over as a white belt. Within three months, Masters Raul and Xavier recognized he was more advanced and moved him up to a green belt. They also recognized his abilities as an instructor and in 1992, as a brown belt, he began to assist Instructor J.P. King (Lo Sifu’s grandson). 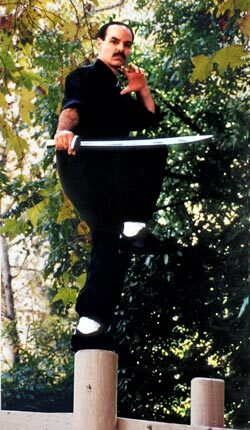 After receiving his black belt in 1993, he began filling in for Masters Raul and Xavier in their absences. By this time, he was already on staff at the church and it was a natural transition to assist in San Soo, along with his other ministry duties. During the course of his studies in San Soo, Michael had the privilege of meeting Lo Sifu and watching him teach the instructor’s class quite often. His most vivid memory of Lo Sifu is reflected in his recollection, “When I met Jimmy, he was bigger than life.” Although he was not studying under Master Raul at the time, he probably had the privilege to see him in action as well. To some, it may seem as though Michael took a long journey on the way to receiving his Masters in San Soo, but when you look at the whole picture, you can see the hand of God at work. The study of San Soo appealed to the competitiveness in him, and the additional years nourished his need to know as much as possible about the art. This desire to know every aspect of the art has only made him a better instructor and enabled God to use him on many levels. He is both an instructor of San Soo and the Word of God in the studio at Calvary Chapel Golden Springs. Since first coming to Calvary Chapel West Covina, God has used Pastor Raul to teach Michael San Soo and also the Word of God. Michael has employed the same single-mindedness to the study of the Word as he has the study of San Soo, with much greater rewards.